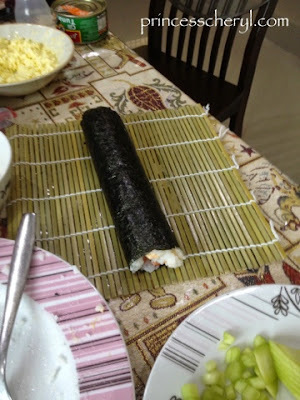 I realized Abigail was enjoying very much the Japanese rice when we were in Japan, so I decided to make sushi for dinner in one of those not-so-busy working day. 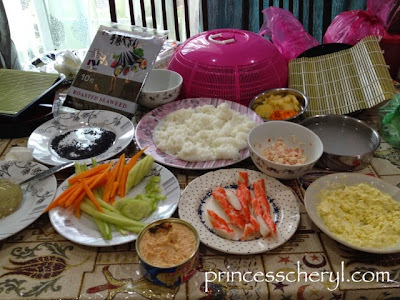 Well...we miss eating Japanese food too... so ended up I took half day off to do the preparation. I had gathered some of the ingredients during weekend grocery shopping, and what's left to buy were Unagi and Salmon sashimi. 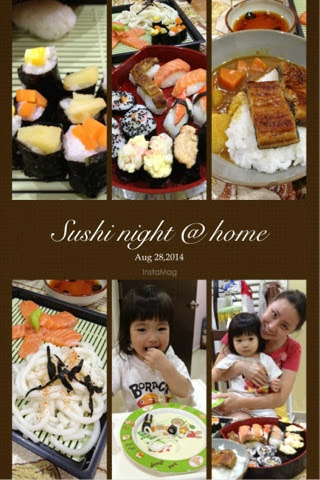 Left company around 2pm, grabbed the fishes and reached home at 4pm. Ingredients preparation took me another hour plus. So I only started wrapping the sushi near 6pm, just in time for dinner. The very last time I made sushi was back in year 2002 (wow that was really long ago! ), and I had lost my cookbook... So this round I just base on gut feeling on the sushi wrapping hehe. 2. Scoop the rice with your palm and gently rub them against each other. This is polishing. Rinse and discard water. Repeat this process 1-2 times. 3. Let the rice soak in water for 5 minutes. Drain out the water and transfer the rice into the rice cooker bowl. 4. Add cold water following the instruction on the rice sack. Different brand may differ for the amount of water needed. The brand of rice I use is Sumo Calrose Rice, it requires 2 cups of water to 1 cup of uncooked rice. Start cooking. 5. For making sushi vinegar, combine the rice vinegar, sugar, and salt in a small saucepan. Bring it to a boil over medium high heat until sugar is completely dissolved. Set aside to let it cool. 6. When the rice is cooked, moisten a large bowl with water so the rice will not stick. Transfer the cooked rice into the bowl and spread out evenly to let it cool faster. 7. While the rice is still hot, add the sushi vinegar over the rice. Use a rice paddle to slice the rice to separate the rice grains instead of mixing. Gently flip the rice in between slices. Repeat until rice is cooled. 8. Keep the rice covered with a damp towel until ready to serve or wrap. 2. Place a sheet of seaweed your sushi mat, with the rough side facing up. Spread a ball of sushi rice on top, evenly cover from the near edge to about an inch from edge. Keep your hands wet with a mixture of water and rice vinegar. 3. 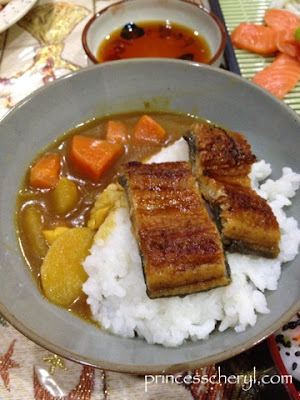 After that add the ingredients that you like onto the center part, then top up with more rice. Basic tuna or salmon roll: These rolls typically just have just tuna or salmon rolled up, without any other ingredients. Ahi roll: Yellowfin, cucumber, daikon, avocado. Shrimp tempura roll: shrimp tempura, avocado, cucumber. Phoenix roll: salmon, tuna, crab sticks, avocado, tempura batter (fried). 4. Hold the edge of the mat with your thumbs. Start with the edge that has your first ingredient next to it. Lift the seaweed sheet and fold it over the first ingredient. Make sure to keep the ingredients in place and that the rice sticks together. 5. Continue to roll. 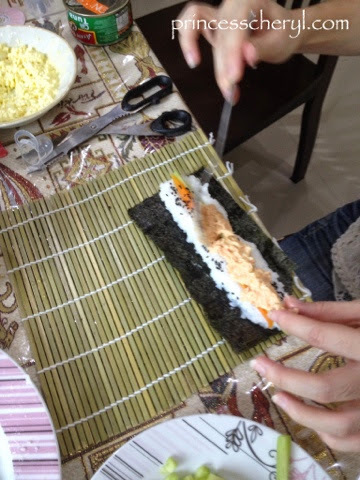 Tuck the front edge of the seaweed sheet into the roll, and remove the mat as you continue to roll the sushi. Roll slowly to ensure sushi coming out even. 6. Tighten the roll afterwards to keep ingredients from falling out when we cut it. Just roll it back and forth in the mat to tighten and seal it. 7. Allow the roll to sit for a minute or two before cutting it. Seaweed sheet will lightly moisten from the rice and less likely to tear. 8. Cut the roll into sixths or eighths using a sharp, wet knife. 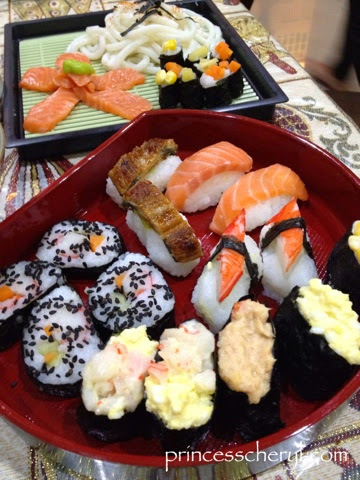 So these are some of the sushi I made. For the nigiri sushi, just take a small amount of sushi rice (about 3/4 the size of your palm), roll and squeeze it together until it rolls into a firm "log" sized rectangle. Then place a dab of wasabi on one side of the fish slice and then place the fish on the rice "log", with the wasabi side on the rice. Done! 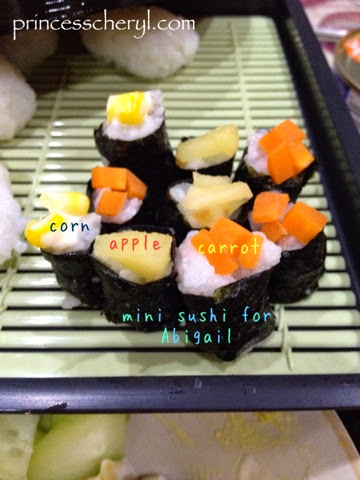 I even made some really small ones for Abigail. Aren't they cute? 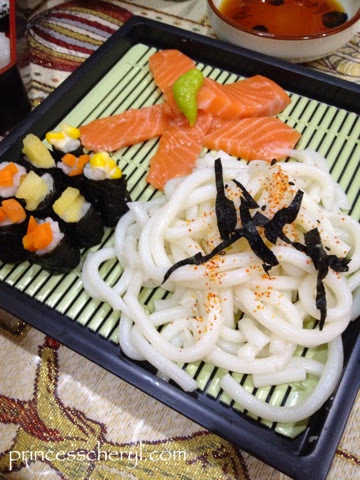 Last but not least, udon!